It is necessary for Vietnam to focus on establishing and developing the value chain to reach the goal of US$3.6 billion in fruit export by 2020. To this end, experts proposed that the State commercialize its activities to support enterprises to consume products through contracts accounting for 30-35% of the total output. This goal is completely on the basis of the fact that in the first two months of the year, fruit export enterprises have received many good signals from the market. According to Mr. Do Ngoc Chat, Director of Viet A Fruit Export Company, the output of the Philippine’s bananas has dropped sharply due to aging bananas, Guangxi (China) has lost its season leading to the fact that China has increased the amount of imports from Vietnam, pushing prices up. Similarly, China’s dragon fruit market in the first months of 2019 has been also consumed strongly, keeping the price of dragon fruits at a high level. This is also the market that consumes about 80% of Vietnam's dragon fruit export. 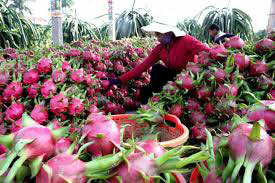 Many gardeners in the Mekong Delta also say that red flesh dragon fruit is now sold at VND35,000 – 40,000/kg depending on each type, and the price for white one is VND15,000 – 20,000/kg, nearly 3 times the low season price last year. Similarly, the banana price is high at VND14,000-16,000/kg and Thai jackfruit is up to VND55,000 – 60,000/kg. Even when the price of Thai jackfruit has reached the highest level in the past years, the gardeners have not had enough for traders to buy and export to China. Durian price is also high, about VND65,000-75,000/kg depending on each type. This is thanks to durian being greatly consumed. Previously, in 2018, the export value of fruits and vegetables reached US$3.8 billion, an increase of 47.3% compared to 2017, of which fruit products accounted for over 80% of the total value. The main export fruits are dragon fruit (accounts for US$1.1 billion), followed by banana, ramutan, longan, litchi, mango, mangosteen and durian. Also in 2018, Vietnam's vegetables and fruits were exported to 13 major markets in the world, of which China is the largest, accounting for 73.1% of the market share, the rest are selective markets such as the U.S., South Korea, Japan, the Netherlands, Malaysia, Thailand, Australia, etc. In particular, FAO forecasts show that the vegetables and fruits market has the largest proportion in the global fresh food group, of which vegetables and fruits account for more than 59% and have the growth of 2.88% in period 2016-2021. In the coming time, the demand for fresh and processed vegetables and fruits in the world market is forecast to increase. This is a good opportunity for Vietnamese vegetables and fruits to expand export to difficult markets such as Japan, South Korea and the U.S. However, it must be acknowledged that despite the large volume of exports each year, the amount of processed fruits is still limited in both type and quantity. Currently, there are only about 145 industrial vegetable and fruit processing establishments with an annual capacity of over 800,000 tons. There are 71 processing factories in the South of Vietnam only, most of which are short of raw materials and the actual capacity is half the designed capacity. Also in the South, there are 14 types of fruits which occupy a large area of ​​over 10,000 ha/type. Mango ranks first with 80,000ha, followed by banana with 78,000ha, dragon fruit 53,000ha, orange 44,000ha, pomelos 44,000ha, longan 35,000ha, durian 47,000ha, pineapple 33,000ha and lemon 27,000ha. Meanwhile, the global markets are increasing their demand. Even the easiest market - China is gradually becoming more demanding. In particular, China now allows the official importation of eight kinds of fresh fruits from Vietnam including dragon fruit, rambutan, mango, longan, litchi, watermelon, banana and jackfruit, with certificates of fruit quarantine. The U.S., Japan, South Korea, New Zealand, Australia also require strict standards, including that fresh fruits must be treated with hot steam and be irradiated before being exported. These problems increase the price of products and may cause the risk of losing the market. However, for an industry that "pays even money to receive the change" such as agricultural investment, enterprises still hesitate because of great risks. Therefore, Vu Kim Hanh, an economic expert said that the State must commercialize its activities.